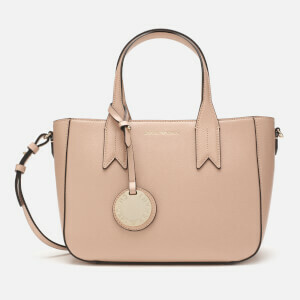 ‘The Editor’ light pink cross body bag from Marc Jacobs. Constructed from grained leather, the structured tote boasts a multi-compartmental design with a zipped interior between two outside pockets. Carried using twin handles that are reinforced for durability, the multi-functional handbag is detailed with silver-tone accents, a removable padlock and key charm and protective leather feet panels at the base. Finished with appliqué branding to the front and branded hardware throughout. Comes with a branded dust bag. Dimensions: H: 21cm x W: 19.5cm x D: 11cm. Handle Drop: 13cm. Strap Drop: 56cm.